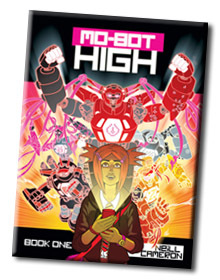 Don't forget, Mo-Bot High season 2 starts in issue 22 of The DFC. Did I mention that it is going to be FLIPPING AWESOME? Check out more funky DFC-related videos on the new DFC YouTube channel! 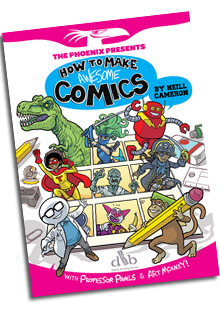 I will be at the Birmingham International Comics Show this sunday (5th October) - I'm on a panel about the DFC at 3pm and will be otherwise hanging around the DFC booth or just generally floating about the place looking confused and a little tired. (Going on past form at comics conventions). 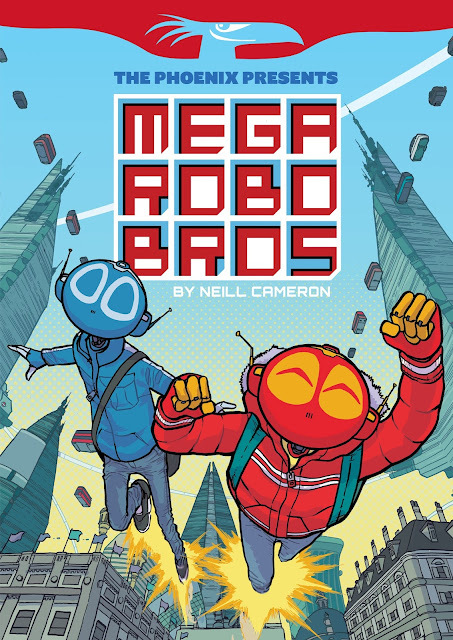 There is a feature about current developments in British comics in the latest issue of the Judge Dredd Megazine which features an interview with my fellow DFC creator Garen Ewing (and a tasty little smidgen of Mo-bot art). Garen posts about it here. There was something else. I forget what. 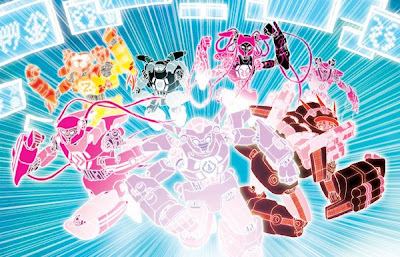 There is a brand new animated trailer for Season 2 of Mo-Bot High over on the DFC website. Go check it out! It is both NIFTY and AWESOME. Be sure to check out next week's issue (#19) for a special teasery trailery preview of the new series, and then it all kicks off proper in issue #22 (on sale 24/10/08). What do you mean you aren't subscribed already? Go and subscribe! That's what they said on the news. I recently won a competition on the highly enjoyable movie review podcast Filmspotting, and got to pick a film for the guys who host the show to review. 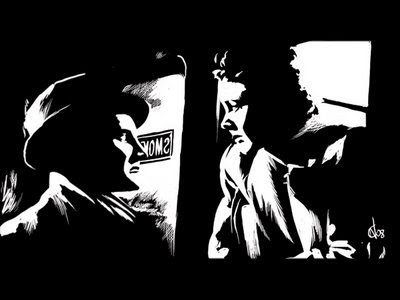 I went for Brief Encounter, as - well, it's just awesome, isn't it? A perfect marriage of script, performances and direction. Also, everyone talks hilariously posh, and there's a highly entertaining moment where the kid playing the daughter looks straight into the camera by mistake. Many chuckles! Anyway, why not go and listen to the show? (The review starts a few minutes in). I thought it might be (mildly) fun and / or interesting to show the process I go through in producing an illustration - in this case a t-shirt design for AR Mcguire - steadicam operators extraordinaire. 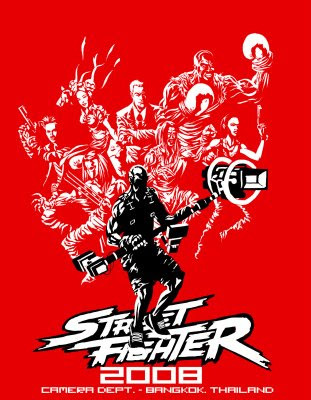 This was for a promotional t-shirt to be given away to cast and crew on the set of the new Streetfighter movie, then shooting in Thailand. 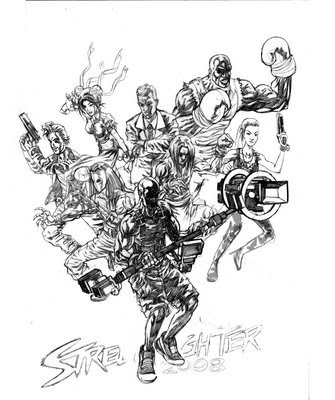 I started with a rough pencil sketch, based on the brief - to produce an illustration showing the AR steadicam operator as a Streetfighter-style character, surrounded by the actual characters in the movie. I didn't worry too much about likenesses etc. at this stage, as it was just to get the basic gist of the design in place. This then got changed and added to a couple of times, as the client requested additional characters and various minor alterations. 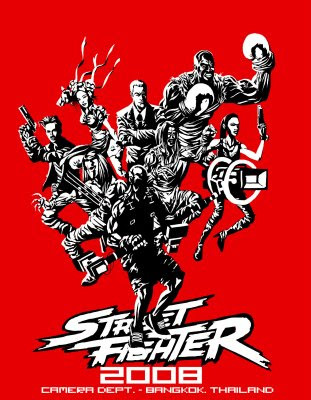 2: Balrog pops up top right, M. Bison (top centre) has his dodgy arm attended to. 3. A new challenger! And another. I forget these guys' names. 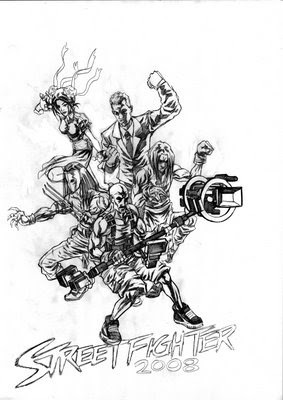 Once the client was happy with the roughs, I then inked the design. I usually do my 'inking' in Manga Studio, but decided to try a different approach for this. 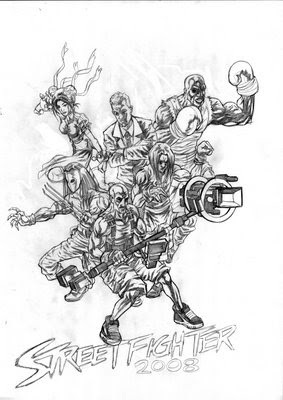 I started by drawing in the white highlights on the characters, and then filled in the black shapes behind them. I really enjoyed working this way, and love the high-contrast vaguely-Frank-Miller-y effect it gives you. I'm totally going to try drawing a whole comic in this style. One of these days. When I get a minute. I stuck in a red background to give these JPEGs a nice high contrast look, but the actual files were sent to the client as unflattened files with a transparent background, so they could be printed on the t-shirt colour of their choice. I produced a couple of versions, one with the black figure art for all the characters and one with it only on the camera operator.